Elementary Shenanigans: Cloudy with a Chance Recap and Unit! Alright friends...it is here and it is ready to go! Cloudy with a Chance is now posted to TPT! Here is a little recap of our weather fun in second grade! 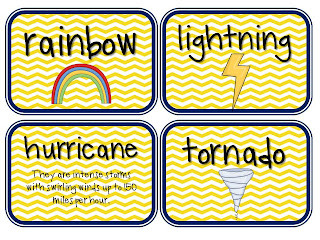 Don't forget to pick up this little freebie (weather vocabulary cards) to use throughout this weather unit! Happy, Happy Sunday Friends! I am counting down the days (4) until a MUCH needed fall break! Woohoo!!!! Hi Hope! Your unit looks really nice. I was wondering if you could give me some more information on how much the book "Cloudy With a Chance..." is a part of your unit before I purchase it. I didn't see if there were any specific "Cloudy With..." activities when I looked at the outline. Thanks! My e-mail is christina4062@hotmail.com. I am very excited to buy your unit and use it in my classroom this spring! I put a shout out about it on my blog! Yes! I have been waiting for this since you mentioned it a while back. I mentioned it on my blog, I can't wait to download it and start using it! Thanks!